Are you trapped in your business? Exhausted? Desperately in need of a healthy holiday but can’t get away without sending your business into a meltdown? It is possible. Imagine this…. waking up in French mountain chalet, feeling fresh, ready for daily workshops and personal support on the Transition to Working From Anywhere education program. Cycling or hiking through stunning mountains, chatting over aperitifs and home-made French provincial food served in the garden and immersing yourself in local village culture is also part of daily life. Worried about your business? Don’t be. Over a 2 month program pre-retreat, Andy helps get you and your business ready to Work From Anywhere. It’s all included in the package. Bring your laptop, hiking shoes and an open mind. Get ready to “Integrate Work & Life As One”. July 2019. Final dates to be confirmed. We are based in the village of Le Vert close to the town of le Bourg d’Oisans at the base of the legendary Tour de France climb, Alpe d’Huez. Who are Karen and Andy? Andy Willis, runs a successful business without a permanent office. 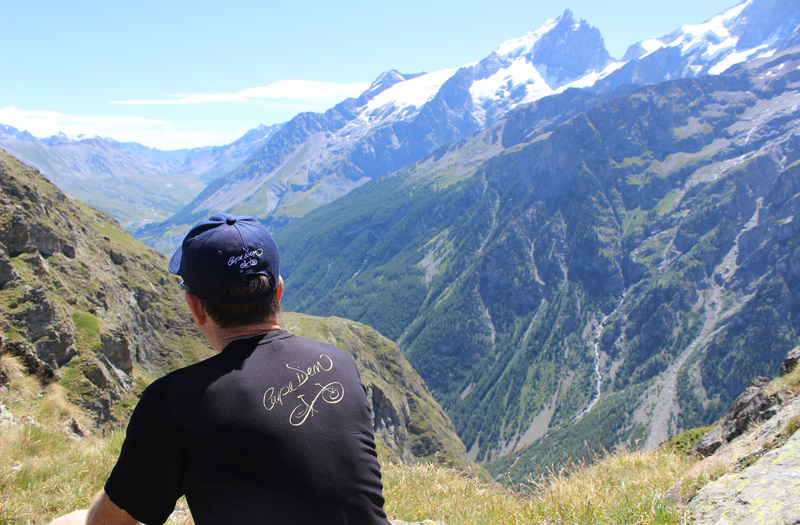 He’s spent the majority of the past three Australian winters cycling and hiking in the French Alps, working on his business and immersing himself in the small French village community. Andy spends the rest of the year in the small but beautiful coastal village of Tathra on the Far South Coast of NSW, Australia, fitting his work life around the surf, cycling or simply walking on the beach. Karen Willis is the founder of Sharing Bali & Beyond and has been running healthy retreats in a small village in Bali for nearly 10 years. An ex-fashion industry player and wanna-be writer, Karen calls Bali home. Every day is a blend of WFA workshops, one-to-one sessions, active and cultural outings. We really do integrate work and life. We mix in visits to villages, call in to local markets where possible, have time to chill out in the garden of our Gîte and enjoy meals and wines served by our host Pauline. How do I know if WFA is right for me? Good question. To help get some clarity around this, fill in your details here. Andy will then set up a video call to chat about where you are in your business/life and what you are looking for out of the trip. Andy’s purpose in life is to help people create choice around WHEN and WHERE they work so that they can seize every moment of every day. There’s no need to jump off the cliff to do this, Andy specialises in transitioning you, your staff and your business to operate the WFA way. My partner is not in the business, but wants to come along. What can they do while I am in WFA mode? Walk into the town of le Bourg d’Oisans. Cafes, shopping, cinema. Approx. 25mins on a small road. Chill out at the nearby picnic and pond area. Rent a bike for the week and explore the area whenever they like. Karen will be available to help organise any extra activities. Can you tell me more about the hiking and cycling? Think mountains, lakes and valley scenes that can only be described as epic. Prepare to get breathless, knocked out by the natural beauty. We’ve hiked every one of these trails with our local guide, each one left us inspired and energized. Cycling on E-Bikes opens up a whole new world. We ride amongst breath-taking scenery, mainly on smaller roads, the e-bikes taking the pain out of the climbs. Expect a wonderful fun day out. We will choose the best hike and cycle route to suit the group and the program. We stay in what’s known as a Gîte. (the dictionary defines it as: a small furnished vacation house in France, typically in a rural district). It’s an old house from 1750 restored in 1992 by Pauline and Éric. They preserved the ancient appearance by using stone and wood. (Pauline and Eric, our hosts live in the house next door). The rooms vary in size and outlook, each with its own charm. Simply decorated in provincial style, each one has a private bathroom. Towels and bedlinen are supplied. There is a lovely dining room and living room built in unique mountain style for all to share. You are free to roam the garden or take an afternoon nap in one of the comfy chairs. There is an extra chalet with a room we use for our workshops. It’s a lovely family environment, yet you still get your own space and independence. There will be other guests staying as there is capacity for 20. We will most likely be in the company of other cyclists and hikers. The closest airport is Lyon (2 hrs by car). The closest train/bus station is Grenoble (1 hr by car) We will provide group transfers from Lyon. Exact details will be confirmed once we have everyone’s arrival details. I highly recommend that you overnight in Lyon airport hotel if you are on a long-haul flight. I am such a foodie. What do I have to look forward to? The joys of travelling often revolve around food and conversations at the dining table. Our hosts invite us to their dining table for breakfast and dinner daily. It is local fare, using fresh produce and vegetables from their own garden. Breakfast is fruit juice, milk, coffee, tea or herbal tea, along with homemade jams, cheese and yoghurt, cereals, dried fruits. The bread is from the bakery “Boulangerie”, local brand of quality, with baguette, bread with cereal and toast. We meet for dinner in the garden, enjoying an aperitif before the meal. The daily menu is made with vegetables and a chosen meat from a local butcher or a single dish based on cheese like tartiflette, fondue, raclette. Pasta is often included. The cheese plate is from regional products. Wine is served with dinner, finishing up with a herbal infusion at the end of the meal. *Lunch is at a different place every day depending on our program. We like a group size around 6 to keep it personal, focused and fun. You are ready to transition into a Working From Anywhere way of life. You own, manage or work in a small business or organisation. You want an active holiday in an exciting new location. You embrace everything about travel… new places, food, customs and friends. You are ready to be part of a small group… collaborating, supporting and having a good time. You have never travelled solo or been overseas. You have the best of both worlds…. the support and safety of a group yet the space to be you. You are excited by the concept of WFA + Simple Luxury. You’re looking for ideas and help in creating a NEW business. The Transition to WFA program is ideally suited to people working in an established small business or organisation. You don’t like places where they don’t speak English as their first language. You are uncomfortable with change. You don’t like spectacular mountain landscapes, French food and wine. I’m excited! How do I book? Book a Chat with Andy to talk about where you are in your business right now and what you’re looking for out of the program. The full details are on the WFA website.